In three phase alternators, we have seen that there are three different sets of windings, each for a phase. So depending upon the total number of slots and number of poles, we have certain slots per phase available under each pole. This is denoted as 'm'. So we have 3 slots per pole per phase available. Now let 'x' number of conductors per phase are to be placed under one pole. And we have 3 slots per pole per phase available. But if all 'x' conductors per phase are placed in one slot keeping remaining 2 slot per pole per phase empty then the winding is called concentrated winding. Note : So in concentrated winding all conductors or coils belonging to a phase are placed in one slot under every pole. But in practice, an attempt is always made to use all the 'm' slots per pole per phase available for distribution of the winding. So if 'x' conductors per phase are distributed amongst the 3 slots per phase available under every pole, the winding is called distributed winding. So in distributed type of winding all the coils belonging to a phase are well distributed over the 'm' slots per phase, under every pole. Distributed winding makes the waveform of the induced e.m.f. more sinusoidal in nature. Also in concentrated winding due to large number of conductors per slot, heat dissipation is poor. Note : So in practice, double layer, short pitched and distributed type of armature winding is preferred for the alternators. Example 1. : Draw the developed diagram for full pitch armature winding of a three phase, 4 pole, 24 slots alternator. Assume single layer winding and of distributed type. Note : This example will explain all the winding terminologies discussed earlier. Full pitch coils are to be used so if phase 1 say R is started in slot 1, it is to be connected to a coil in slot 7 so that coil span will be 6 slots i.e. 'n' slots i.e. 1 pole pitch. As distributed winding is to be used, both the slots per pole per phase (m = 2) available are to be used to place the coils. And all coils for one phase are to be connected in series. So from slot No.7 we have to connect it to coil slot No.2 and slot No.2 second end to slot No.8 and so on. After finishing all slots per phase available under first pair of pole, we will connect coil to slot No.13 under next pole ans winding will be repeated in similar fashion. The starting end Rs and final end Rf winding for R-phase are taken out finally. Connections for R-phase only are shown in the Fig. 3. Now, we want to have a phase difference of 120o between 'R' and 'Y'. Each slot contributes 30o as β = 30o . So start of 'Y' phase should be 120o apart from start of 'R' i.e. 4 slots away from start of R. So start of 'Y' will be in slot 5 and will get connected to slot No.11 to have full pitch coil. Similarly start of 'B' will be further 120o apart from 'Y' i.e. 4 slots apart start of 'Y' i.e. will be in slot No.9 and will continue similar to 'R'. Finally all six terminals of three sets will be brought out which are connected either in star or delta to three ends R,Y and B outside to get three phase supply. 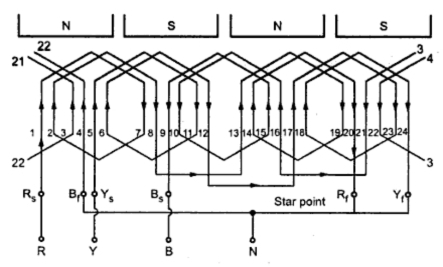 The entire winding diagram with star connected windings is shown in the Fig. 4.